Which Of These Used To Be An Official Olympic Sport? Which Video Game Franchise Features A Character Created By Debug Code? Today, the official Olympic sports, as overseen by the Olympic committee, are pretty firmly established. Tune into the Winter Olympics and you expect staples like figure skating, ski jumping, speed skating, and other established winter sports. In the Summer Olympics, you’ll find a larger stable of events, but still fairly traditional like swimming, running, weight lifting, and a variety of team sports like basketball, soccer, and volleyball. Historically, however, the beginning of the modern Olympics (starting at the end of the 19th century and modeled on the games held in Ancient Greece) was a bit more varied and tumultuous compared to the established traditions of today. Some of the early and now discontinued events were simply variations of current entries that just proved less popular (like the 60 meter dash and the 200 meter hurdles, both quickly discontinued). Others seem a bit odd when held up against the modern roster of activities, like tug of war. Yet between 1900 and 1920, tug of war was in fact an Olympic sport (and a rather curious one at that). The game was much like what you may recall from your childhood: two teams square up on opposite ends of a thick rope and pull strenuously on it until the opposing team is pulled across a line or the rope is moved a predetermined distance in either direction. That bit doesn’t seem so curious, but what will certainly seem so to a modern reader is that the competitions were carried out between “clubs” instead of specific countries. A country could enter more than one club, which led to years where a single country won all the medals, like when the U.S. won all three in 1904 and Great Britain did the same in 1908. 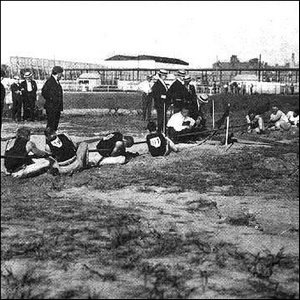 It also led to situations where countries would combine members to create a club, such as in 1900 when Denmark and Sweden combined their tug of war groups to have enough members to compete. Image courtesy of Library of Congress/Wikimedia.